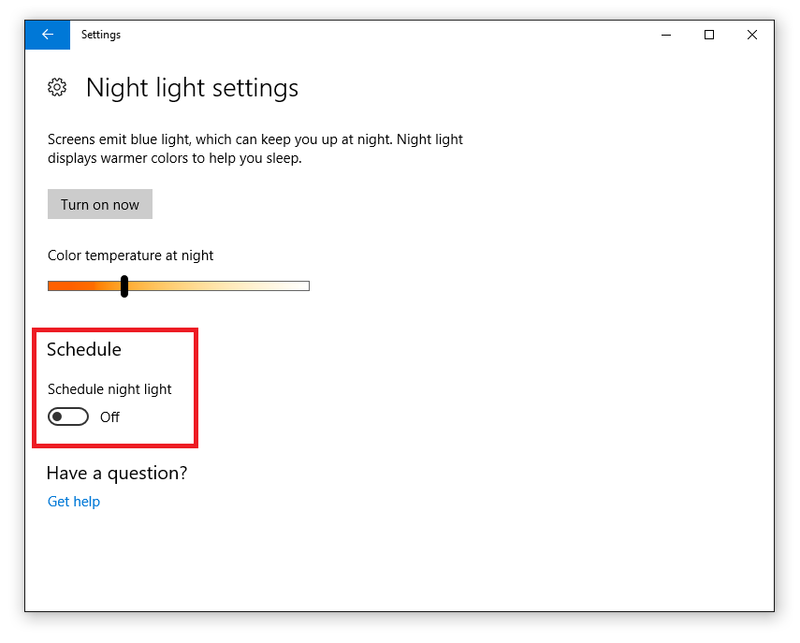 Night light is the Microsoft blue light reduction feature. 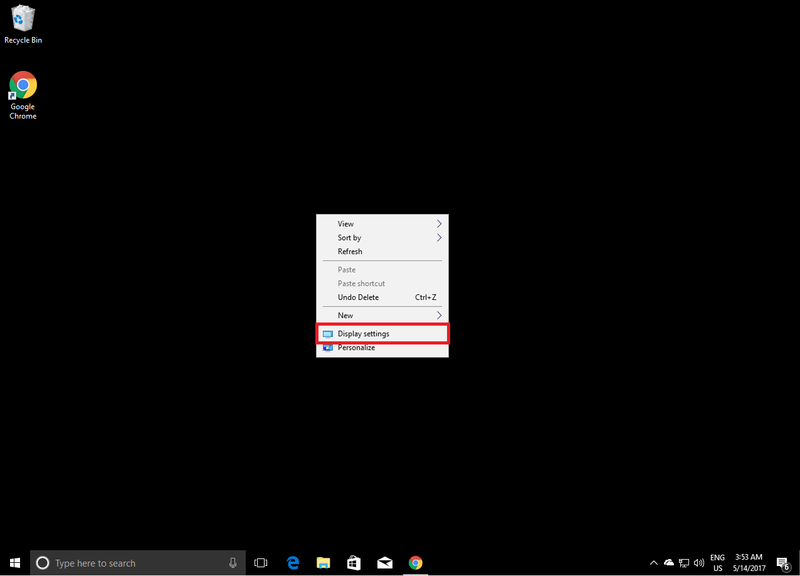 It comes built-in into Windows 10 Creators update. It was also available in the Windows 10 Insider preview before also. 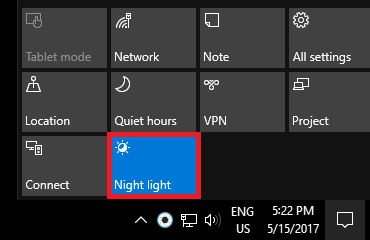 Night light is not available for Windows 7. If you want to use something similar to Night light on Windows 7, Windows Vista or Windows XP, you can use Iris. 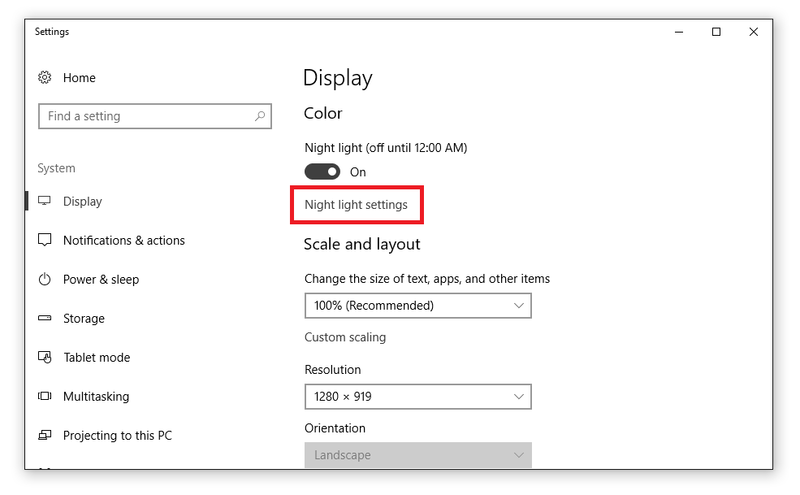 If you have Windows 10 Creators update you can find Night light from the Control Panel. 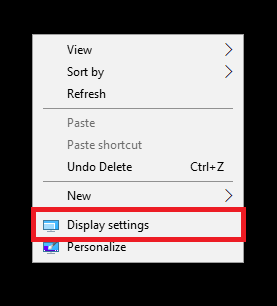 Right click on the Desktop and choose Display settings. 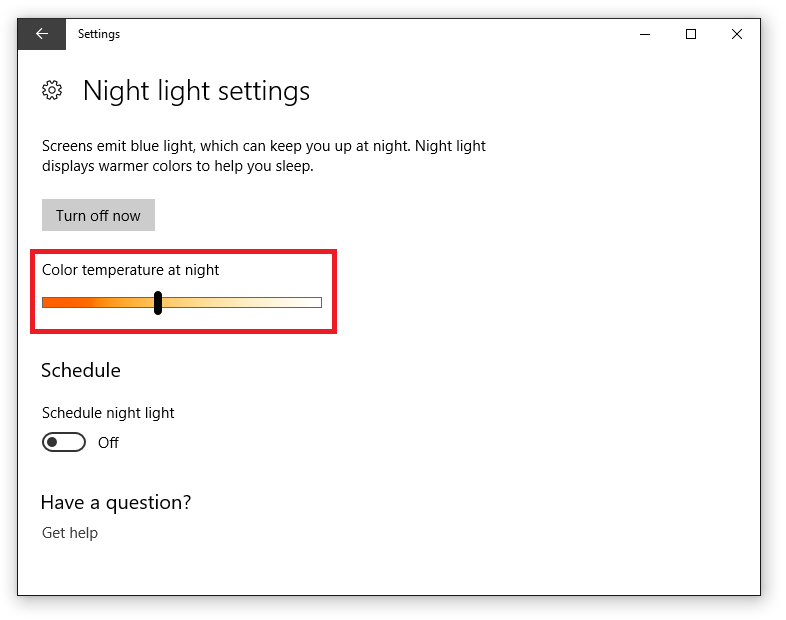 Windows feature for blue light reduction is called Night light. 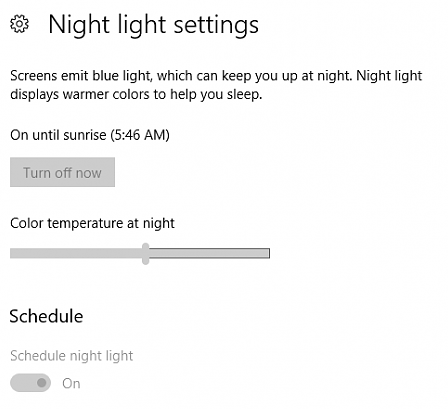 You can enable the feature as a whole by clicking the Off checkbox under Night light. Now Night light is activated. You may not see the changes in the Color Temperature of the screen if it’s day are you have some custom location or time settings. To manually Enable Night light you can go from the Night light settings by clicking the Night light settings button. Depending of if Night light is active you will see Turn on now or Turn off now button. Clicking Turn on now will turn on Night light and the value from Color temperature at night will be used. Your screen should become more orange. If not move the Color temperature slider to the left. Your screen will now be orange for sure. I tell orange, because it’s more easy to understand, but actually the color temperature will be lower and the blue light will be reduced. If you want to disable the effect click Turn off now. 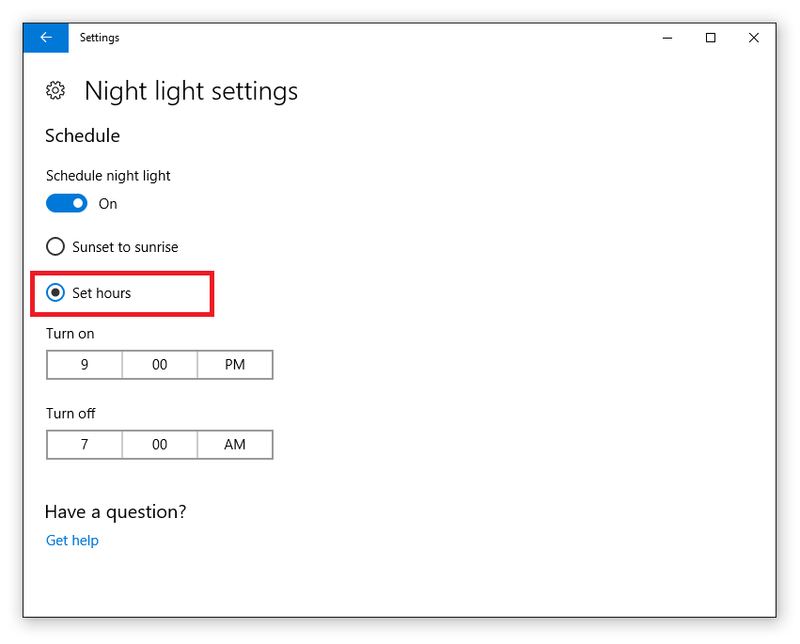 If you use schedule for Night light this will work only for 1 day and the next day it will be automatically again. This means that when you set Night light manually On or Off and the Schedule is turned On this manual configuration will last only a day. The text is now gone and turning Night light On and Off now will make it permament not only for a day. With the Color temperature at night slider you can control the amount of blue light during the night or all the time if Night light is set to On and the Schedule is turned Off. 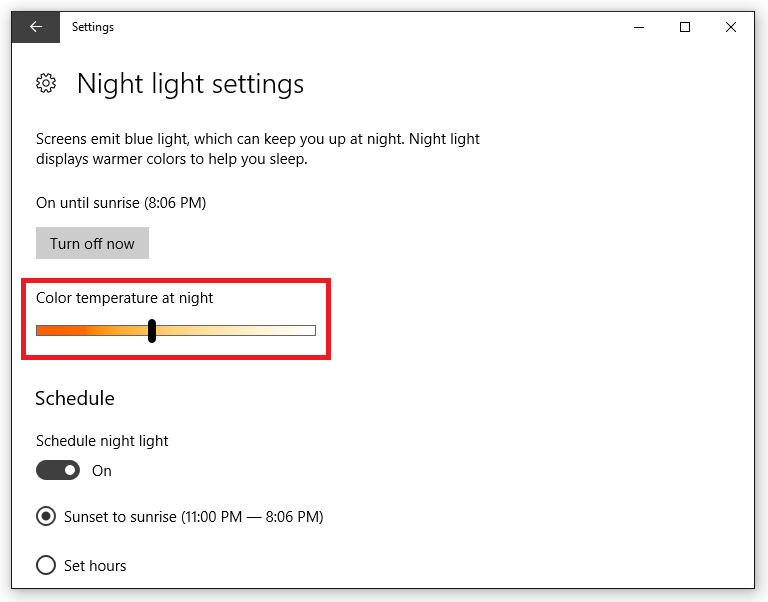 By moving the Color temperature at night slider to the left you will decrease the amount of blue light. There are no actual values, but it the left possible place the value of Color temperature will be around 1200K or Candlelight. 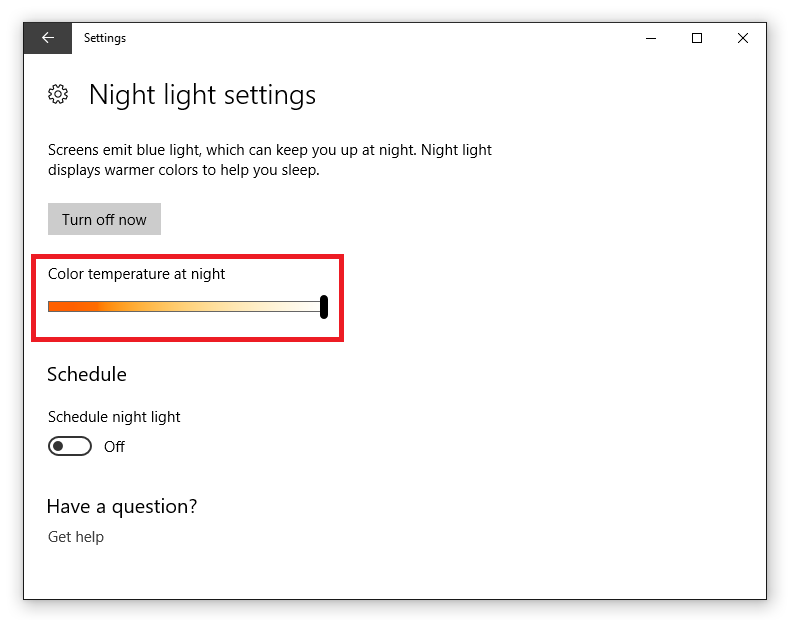 By moving the Color temperature at night slider to the right you will increase the amount of blue light. There are no actual values, but it the right possible place the value of Color temperature will be around 6500K and your screen colors will be calibrated. When you are reducing blue light from your screen your colors will not be correct and this can be a problem if you work with Photoshop or other image editing software. 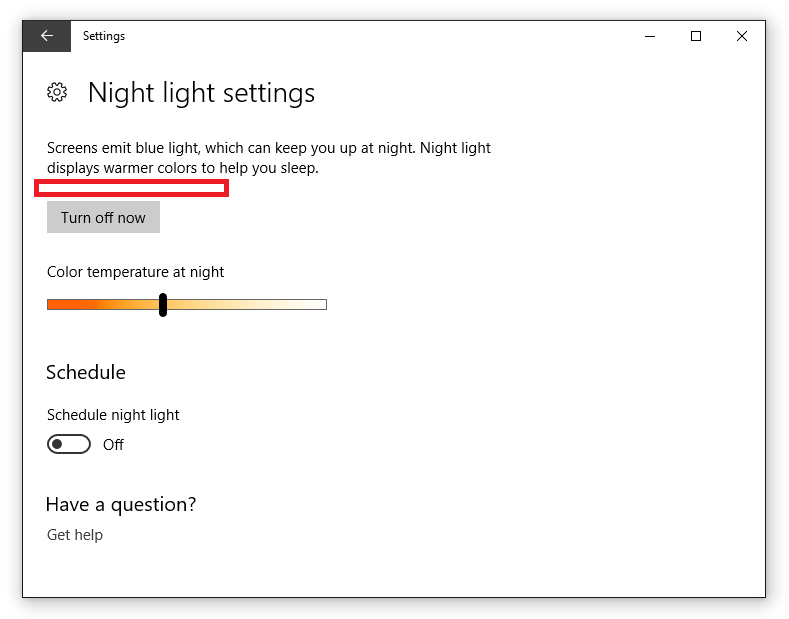 If you need to work with colors, disable Night light or move the Color temperature at night slider to the most right possible position. 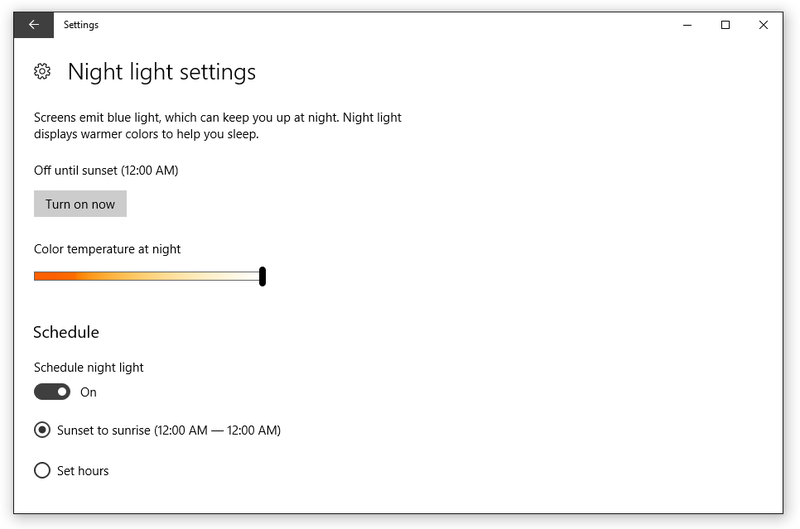 You can select when Night light will be On and when it will be Off by customizing the Night light Schedule. If the Schedule is set to Off, Night light will be controlled by hand from the Turn on now and Turn off now button. If the Schedule is set to Off, the color effect will also be constant and Color temperature at night can be used all the time. 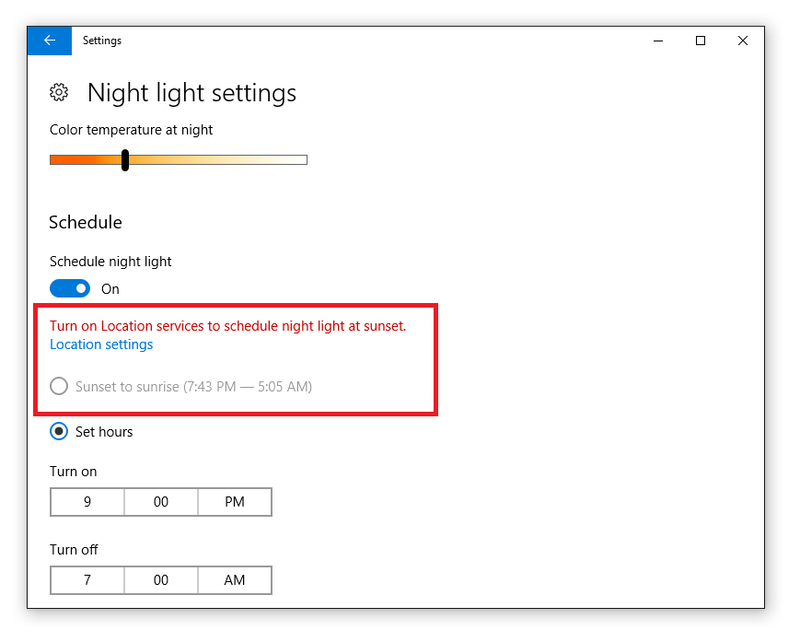 To enable Night light Schedule click Schedule night light checkbox to On. 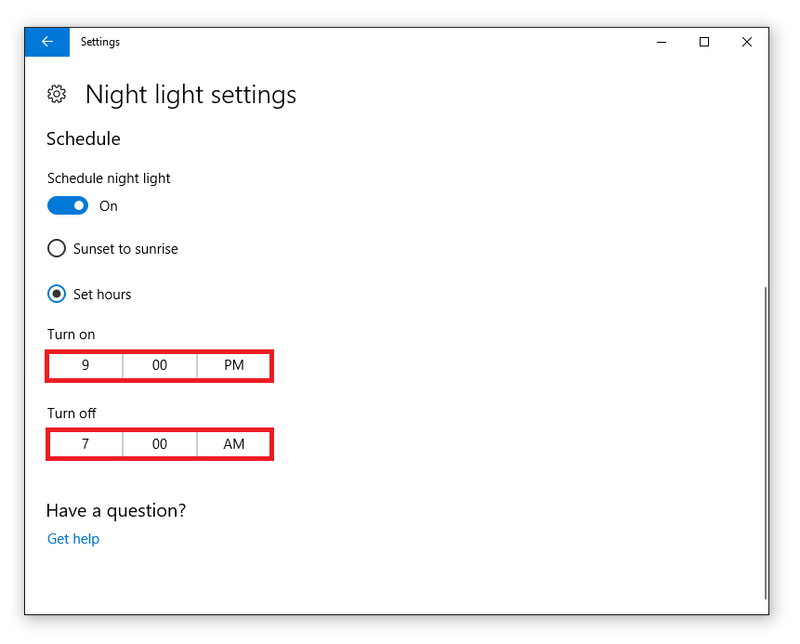 When the Night light Schedule is turned On you will see 2 new checkboxes: Sunset to sunrise and Set hours. You can use them to set the duration of the day and the duration of the night and the sunset and sunrise times. Sunset to sunrise will use your location latitude and longitude to determine when it’s sunrise and when it’s sunset. On sunrise your colors will be calibrated and on sunset Color temperature at night will be used. Location services will be used. By using Set hours you can set your own custom schedule and set your own custom sunset and sunrise time. The first time will be night start time and the second time will be the night end time. This will control when Night light will be On and when it will be Off. 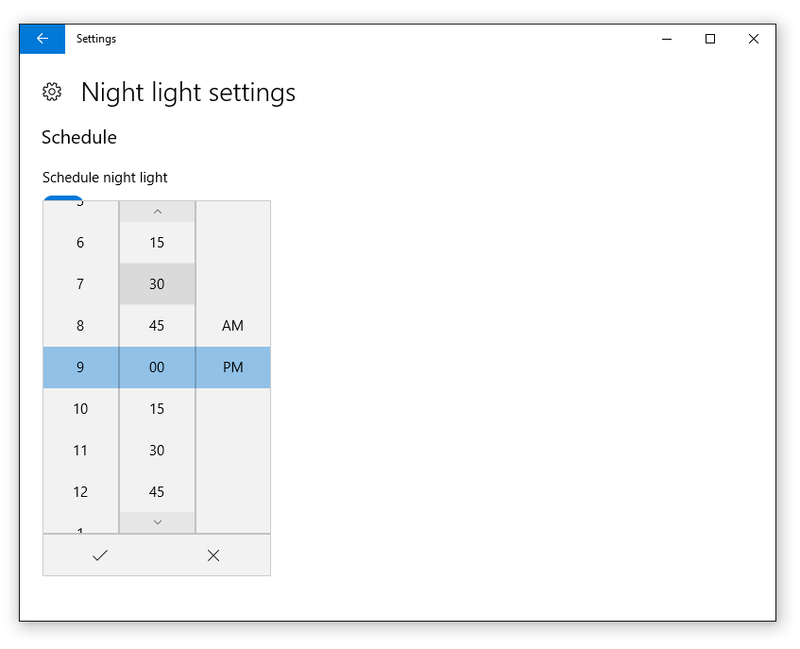 If Schedule night light is set to On Night light will use custom schedule. 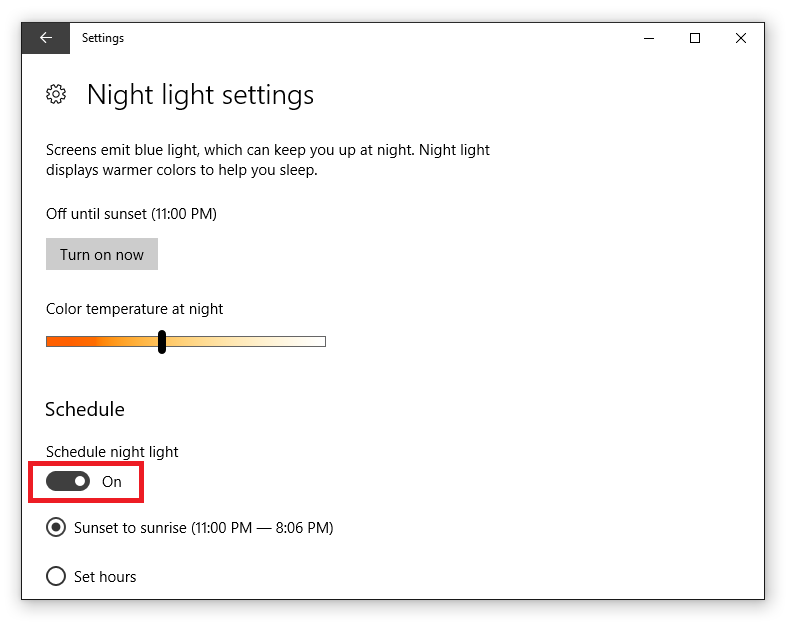 If Schedule night light is set to Off Night light will depend of the Turn on now and Turn off now button for using Color temperature at night or using normal colors. Sunset to sunrise will use your location to determine the sunset and sunrise time of the Sun. You will see this times at the right of the checkbox. Sometimes this option may be unavailable. 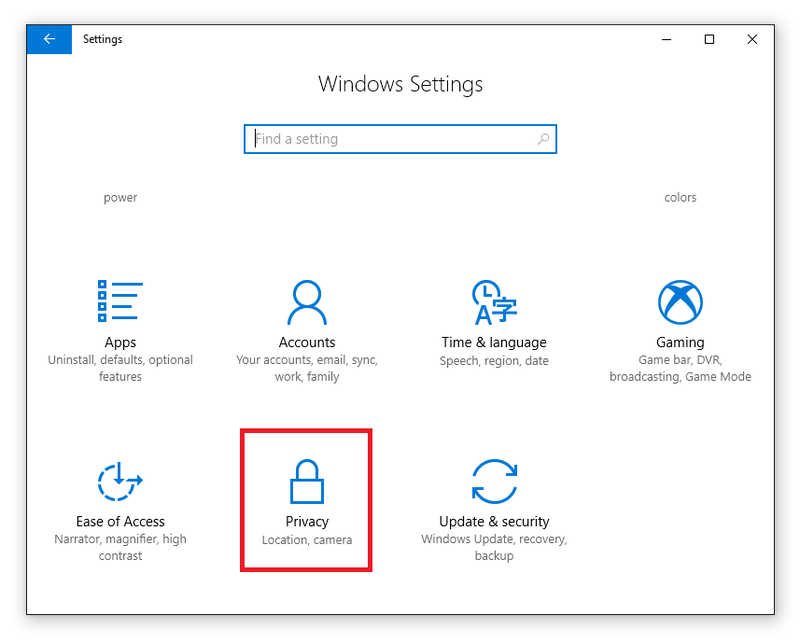 In this case you need to enable Windows Location services. 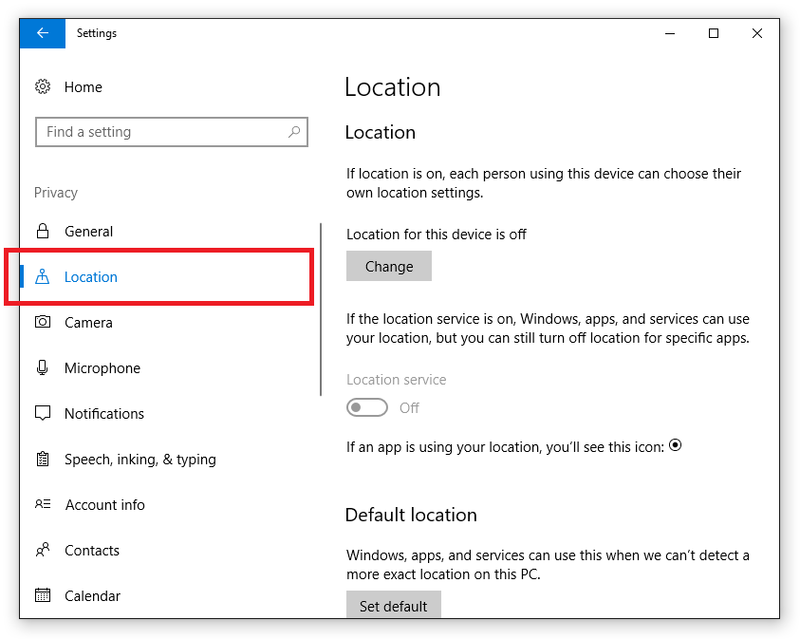 To enable Windows Location services go to the location or directly click the Location settings error link. To do this the manual way in the Control panel click Privacy. Then click the location page from the menu. Here you will see the text Location for this device is off. Click Change and change this setting to On. 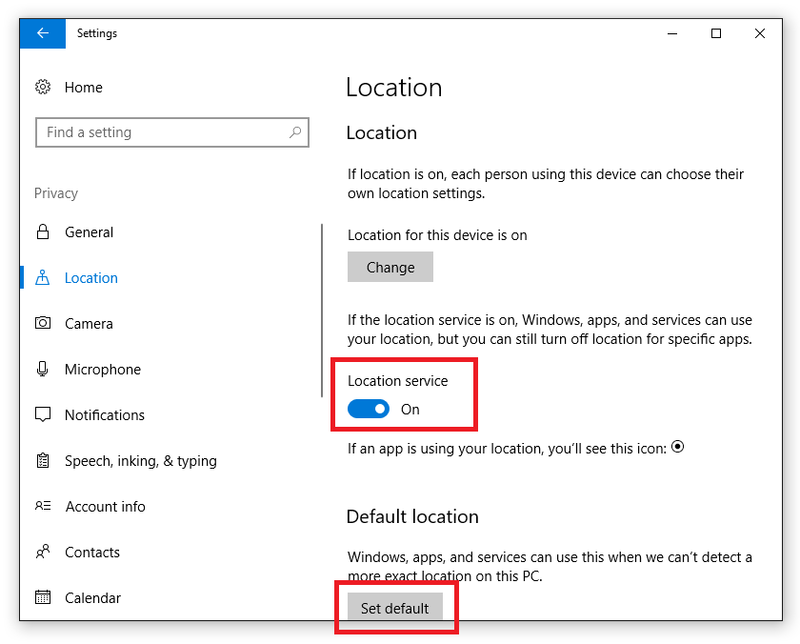 Make sure that Location service is also set to On. 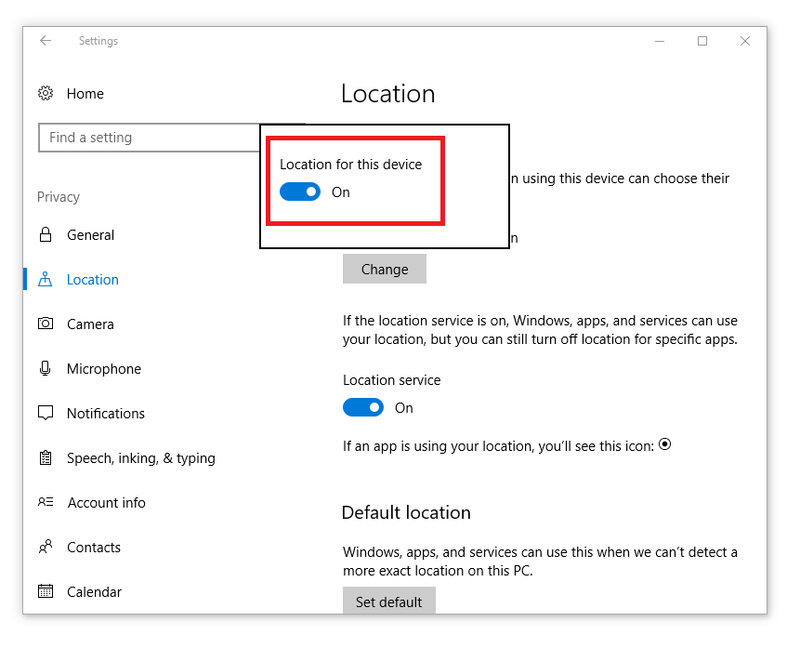 It’s wise to also set your Default location if the detected location seems wrong. 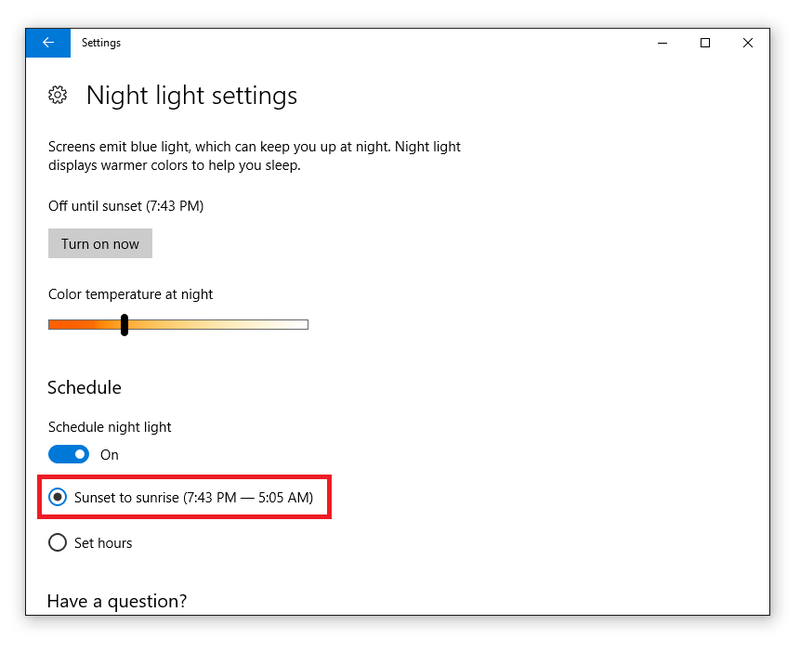 Going back to Night light settings panel Sunset to sunrise is now enabled. If you preffer setting your own custom schedule you can use Set hours. When you click the Set hours checkbox you will see 2 timer pickers for selecting Turn on and Turn off time for Night light. By clicking on them you will open the timer picker from which you can select your time. Note that the minimum step if 15 minutes. 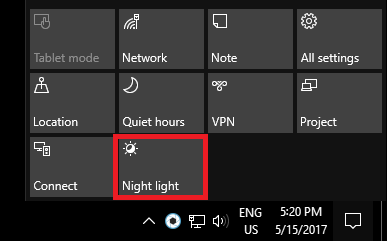 This covers all options in the Night light settings panel. You can also toogle Night light the Action center. Click the notifications button in the bottom right corner of the screen. You will see the Action center. If you don’t see Night light at the bottom of this screen click Expand. Now Night light button will be visible. You can switch Night light On and Off by clicking this button. 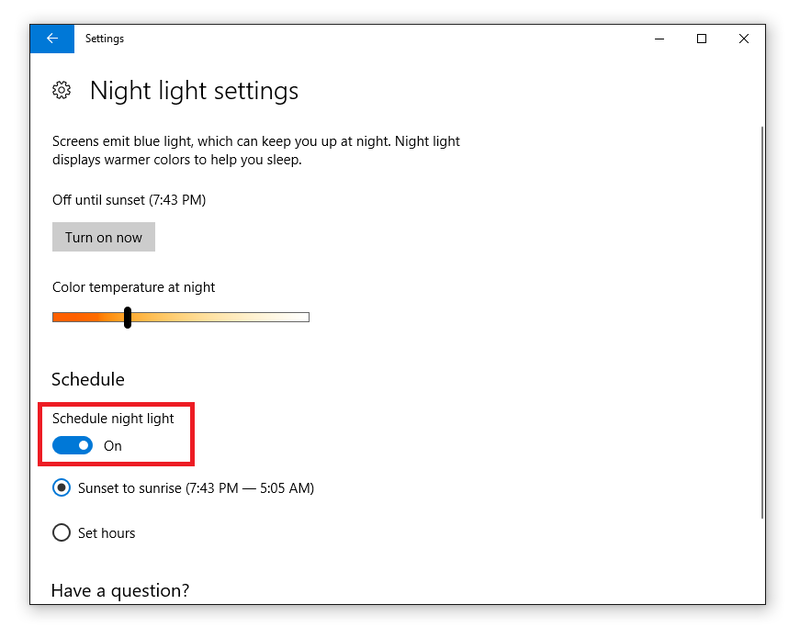 Night light hugely depends on your system clock and date. So make sure that your clock is set to the correct time and correct date. At different months the sun will go up and down at different hours. Remember how we move our clock 1 hour forward or backward depending on the time of the year. 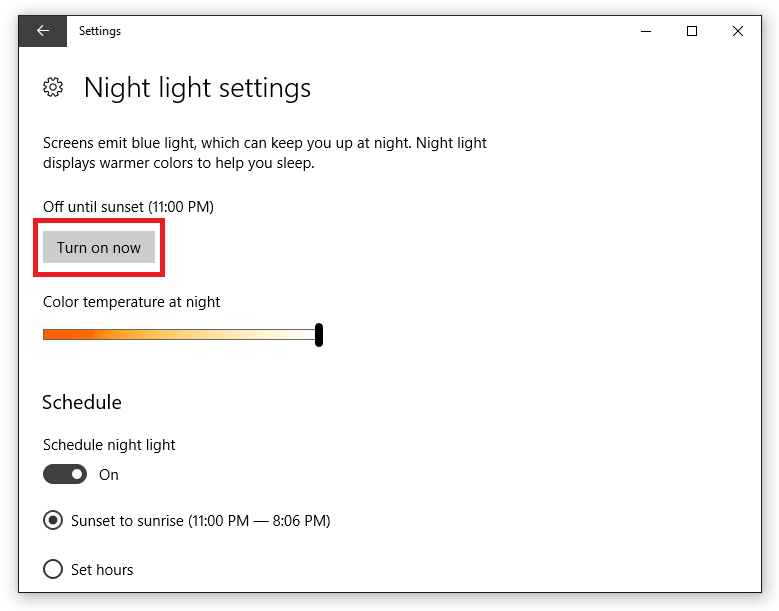 By clicking the Turn on now and Turn off now button there will be gradual close to 1 second transition between bright and dark screen. At the moment the transition when you actually use Night light sometimes is skipped and nothing happens and seems a lot broken. It’s kind of annoying to turn it on and off all the time by hand. I don’t like also that the location services are used all the time. You don’t move your PC most of the time and this is massive battery drain and deal breaker. 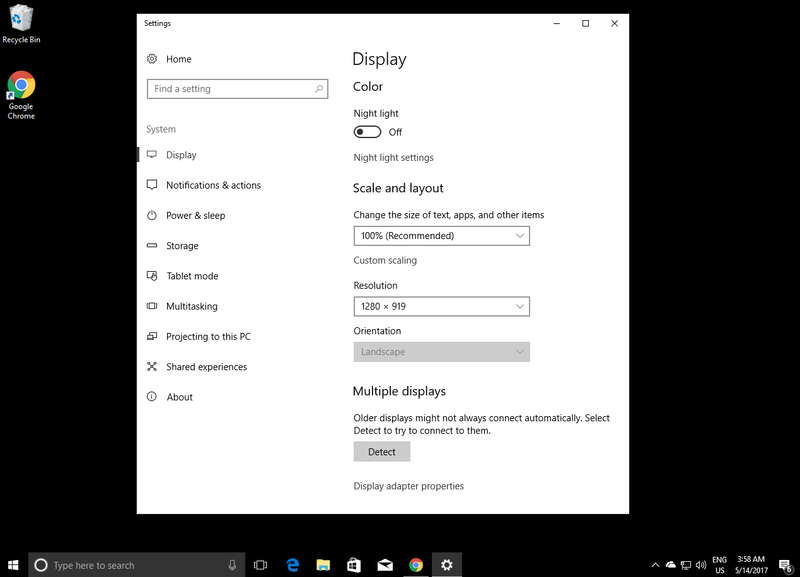 Something nice is that it works above the gamma and the calibration level of the display and tweaking Night light then turning it off will preserve your device calibration. Night light seems to work good with games and doesn’t cause some lag and massive frame drops. This is sometimes problem with f.lux. It works well if it works, but sometimes it doesn’t work at all. 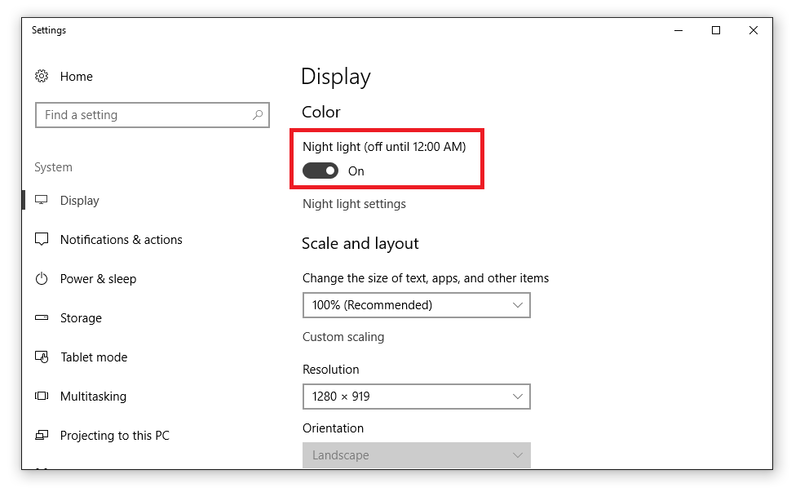 With some games Night light will disable itself when the game is on fullscreen. There are also some other bugs at the moment. Tabbing between desktop and fullscreen game disables the effect for a moment. 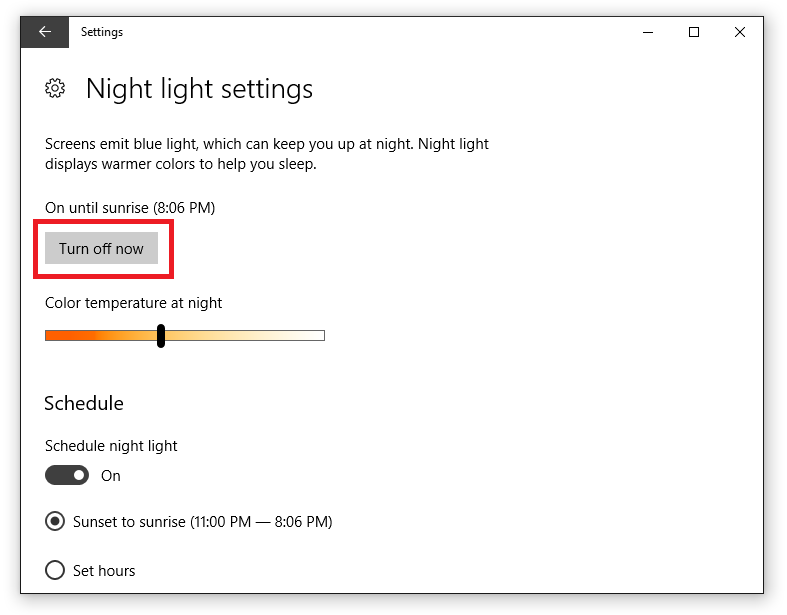 Sometimes Night light will not turn off automatically in the morning or it will not turn on automatically in the evening. 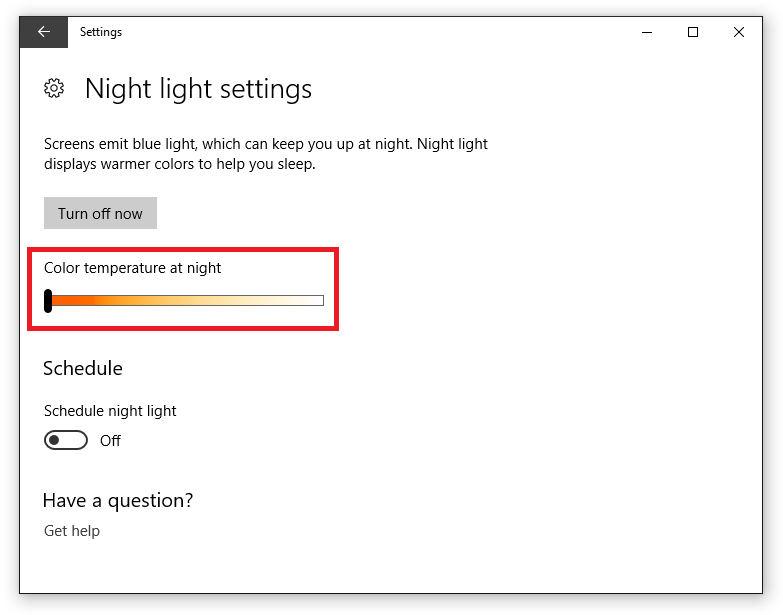 If Exprorer.exe crashes Night light will also stop working. Sometimes it also crashes for no reason. The transition duration should be more slow. It just kicks in when you start your PC. Not sure if this is a bug, but it’s kind of annoying. Night light may be grayed out when you don’t have good graphics drivers. On some machines Night light options may be greyed out like this. The problem most of the times comes from than you don’t have Graphics driver installed. Thus in order to fix Night light just install the latest version of your graphics drivers. If this doesn’t help download this file and double click it. Now Night light should work fine again. I think to integrade the blue light API into Iris, but to not use the night duration schedule and instead to use the Iris sun position and clock duration logic. Some keyboard shortcuts also seem needed. If you liked this review in addition to Night light you can also enable Dark mode. See Dark mode Review (Windows) for how to enable and use Dark mode.